If you’re anywhere near as old as I man you probably spent far more hours than you should have done playing TIM, better known as The Incredible Machine. 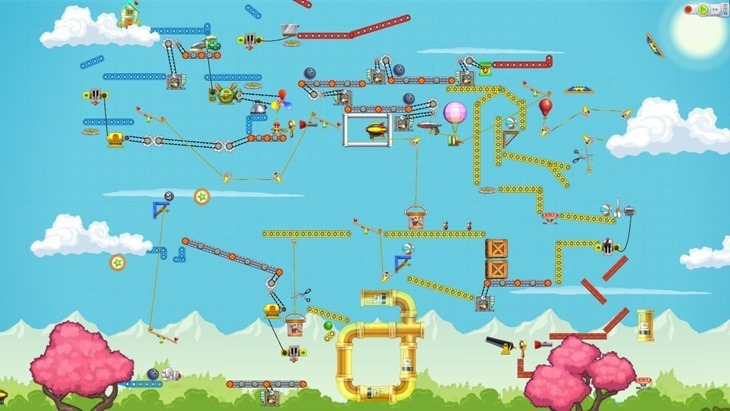 Well the makers of TIM are finally back and have released a brand new game called Contraption Maker which appears to be exactly what TIM was just with more things, more places and more physics. But before you start saying you can just download TIM instead, the guys have added brand new capabilities and features to this game. One of the best of the new additions is multiplayer stage design using the Steam Workshop which then allows you to distribute your levels to the rest of the community across the planet. The game costs just $14.99 and comes with 140 official levels and an uncountable amount of community levels for your puzzling entertainment. Expect to see a lot of YouTube walkthroughs of the more complicated stages, something that would have saved me days of trying (and crying) when I was a kid.